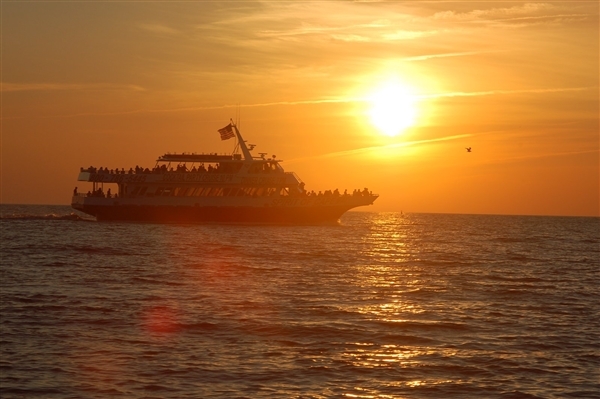 An early evening Voyage Off Shore Aboard New Jersey's largest and most comfortable Marine Mammal Boat, enjoy the Summer Cape May Sunset fading into the horizon as you enjoy the air conditioned cabin with spectacular ocean and beach views. Have a cocktail, enjoy dinner, sight dolphins and a beautiful sunset over Delaware Bay. No other Dinner Cruise in the world can offer top quality food, unparalleled views and dolphin sightings in a single evening. We have the most to offer in Southern New Jersey. We offer the finest food available a float , the largest and cleanest vessel, and a family oriented atmosphere. The Cape May Dinner Cruise is perfect for any celebration from a first date to an 80th Birthday Party. Every evening at 5:30 unitl Mid-September set sail for the Top Rated and Most Beautiful Trip in Southern New Jersey. Must reserve in advance of the trip by 12:00 pm the day of.